Rare Find Beautiful Regal Craft Built 10 Years Old. 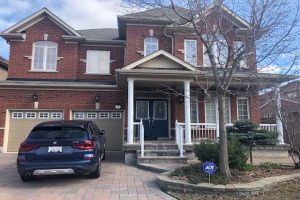 Spectacular Finished 4+2 Bedroom Residence Situated Premium Stone Exterior Detached Home Situated On Large Premium Lot Over 4100 Sq Ft. Include Finished Basement By Builder Close To Schools, Major Hwys, Amenities, & Parks.Quiet Street. Prof Fin/ Bsmt By Builder W/ 9Ft Ceilings. Mstr Bdrm W/ Jacuzzi Tub, D/Sided Fireplace & W/O To Balcony. 2nd Floor Features Skylight. 3 Fireplaces. S/S Fridge (2018), Double Oven Range Hood (2019), Dishwasher (2018), Front Load Washer & Dryer, Gas Burner & Equipment, All Elfs, All Window Coverings, Garden Shed, Gas Line Bbq, Garage Door Opener, Hot Water Rental.